We have a winner of the one dozen cupcakes from Cupcake Delights! 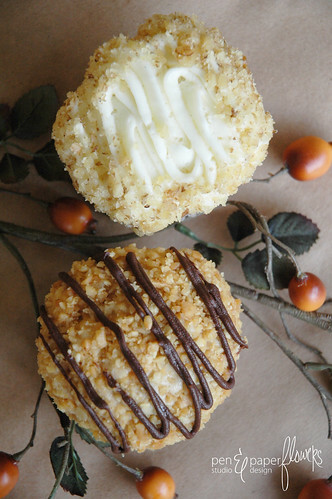 I'll be putting you directly in contact with Judy at Cupcake Delights to select your flavors! Thanks everyone for playing along!! and all of your ridiculously wonderful flavor suggestions!!! You've heard me mention and post about Cupcake Delights many times now. and pleasing to the palette. And I'm lucky enough to be minutes away from this wonderful "cupcakery"
and I have established a professional relationship!! And we both do some advertising for each other. (I even encouraged her to ship cupcakes to Kim from the TomKat Studio and they are going to be featured in one of Kim's recent photoshoots)! Yay!!! Needless to say, it's been a relationship that has benefited the both of us. With that said, Judy and I agreed her recent transition into "shipping available"
makes for the perfect time to offer a giveaway to one of my VERY lucky readers!! Contest ends: Thursday, November 25th (Thanksgiving Day)!! The winner will be put in direct contact with Judy to select the assortment of cupcake flavors desired. I was excited to know she had a FB fan page so we exchanged url's. Little did I know Judy's shoppe was voted best bakery in Orlando in 2008! (and that was after only being open for 8 months)! Wow!! I definitely feel lucky to be so close to such a treasure!! ohhh I LOVE HER and her fb posts always make me sad that I live in baltimore!. Happy fb fan! trucking company... wow what a leap from that to cupcakes! its really hard to choose what i would want, she posts daily about the flavors and i just die!!! wanting to reach through the computer and enter her cupcake shop! i guess for now, from the website i would pick: Turtle! 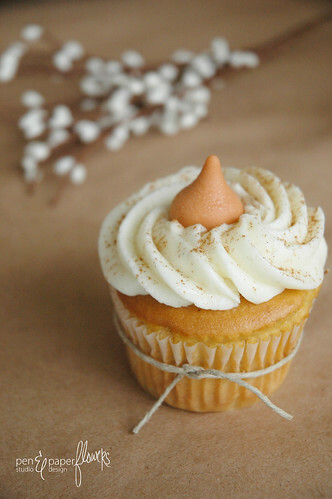 ok and for my last post... lol, i think an eggnog cupcake would be amazing! 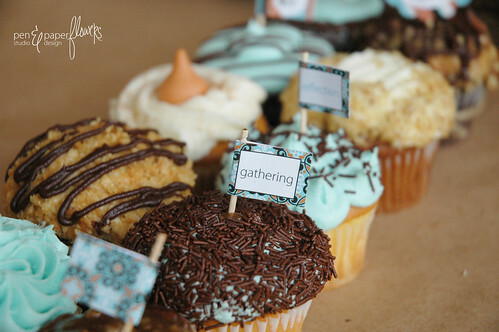 Love this giveaway, I'm always in the mood for cupcakes! I learned Judy took her first cake decorating class at age 13! I would love one of her chocolate chip cookie dough cupcakes! That's my favorite ice cream flavor so I'm sure it tates just as good in cake form! I would love a new chocolate & peppermint cupcake flavor for the holidays! ohhh and a fb fan of yours lol!!! now 5 entries!!! I'm in on this one! 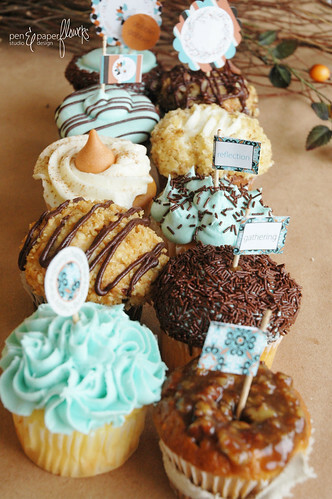 These cupcakes are PERFECT and absolutely gorgeous. The colors of this selection are beautiful. I am a happy fan of yours on facebook. Pecan Pie and Turtle Crunch look so amazingly yummy!! I am a fan of yours On FB! I learned that Judys Father was a Chef in the army and was her original inspiration for her to cook! 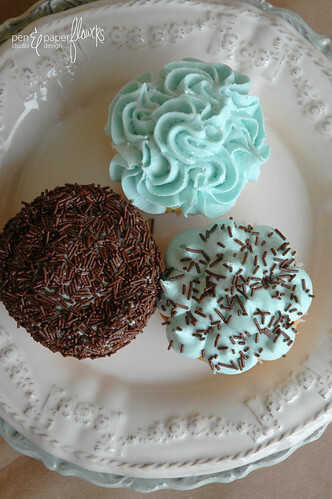 I liked cupcake delights on FB! I LOVE carrot cupcakes but her kahlua and cream sounds DREAMY! 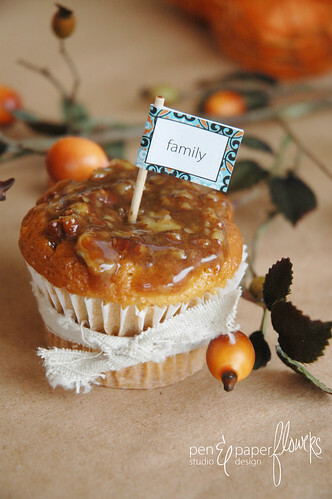 I would LOVE to see a cranberry/orange with candied ginger cupcake, a must have dish on my holiday tables every year! I LIKE Cupcake Delights on Facebook! I learned that Cupcake Delights is in the Orlando area and I wish I'd known that last year! We went to Disneyworld for my son's Make A Wish trip and I SO would have stopped by!!! I am SO already a fan of Pen N' Paperflowers on facebook!!! Love your site! Hmmm.....maybe a December flavor...something with Hot cocoa and candy cane! I think a good December holiday flavor would be Egg Nog! :) YUM! I learned that Judy worked for a trucking company before opening up the cupcake store! Which one I would gobble up right now... Depends on if we are going by pictures or description. I was picking Cappuccino Delight until I read the description for White Madness. They all look amazing. I love everything peppermint so candy cane would be my favorite!!! I am now a fan of Cupcake Delights on facebook. Wish I lived closer! I could DEF gobble up the Cappuccino Delight right now!!! I commented that you sent me. Naughty & Nice -- a red velvet cupcake with white chocolate chips baked in. Then cream cheese frosting drizzled with white chocolate. I read the "About" section of her site and learned that she baked the cake for her brother's wedding. The flavor I would love to try from her website would be the Keylime. The flavors I would like to see for the holiday season are Eggnog or a White Chocolate and candycane flavor. I just became a fan of your page! I would like to see something with pumpkin and cream cheese. We have been to cupcake delites twice and she is always so friendly to us. Her cupcakes are to die for. Didn't realize they had been open since 2007. I would have started going there a long time ago. In ABOUT I found out we both have daughters named Taylor and they are both 12! Cupcake connection! I "like" Cupcake Delights and I told her you sent me! Love to have anything chocolate...hot chocolate cupcakes sound so yummy! I am your FAN!! Yeah Pen N' Paperflowers! When I was a little girl there was a bakery in my home town of Peoria that had the best chocolate cupcakes with cream in the middle and the whole cupcake was covered in chocolate..liked dipped..would love to see those cupcakes again! Became a fan of Cupcake Delights on Facebook. Wow, Judy started her own business selling cupcakes and cakes at 13! Wish I had that kind of drive at that age. At this moment, I am salivating over those Red Velvet cupcakes, yum! I Facebooked liked Cupcake Delights! I had no idea that an easy bake oven could turn into a love of baking and owning a cupcakery. 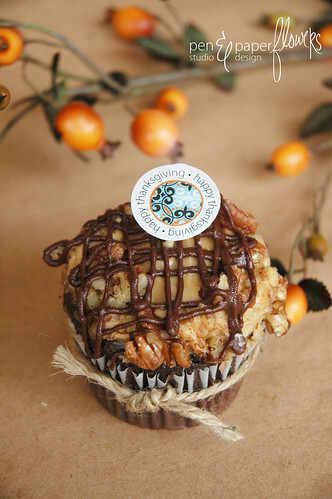 I'd gobble up any of them, but first I'd have the Chocolate Caramel Chunk, anything with chocolate and peanut butter, and the turtle cupcakes. 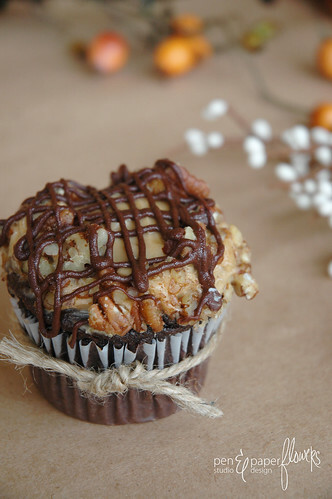 Something like a pumpkin roll, but in a cupcake: pumpkin cupcake, cream cheese frosting, with chopped pecans. 2. I love that Judy has worked in a such a variety of fields. 4. 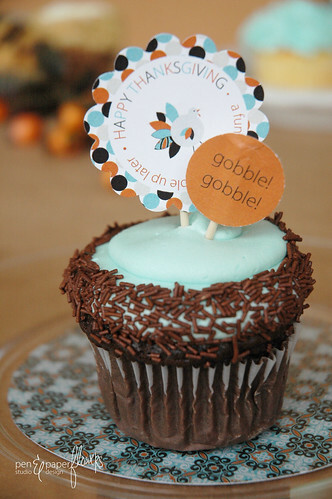 A Holiday cupcake I'd like to see...hmm. How about Santa's White Christmas(the barnies coffee/hot cocoa?) or maybe a hot chocolate flavored...with whipped cream icing? I'm a fan of Cupcake Delights... I've been drooling over them for weeks. Yummo! I learned Judy only uses Madagascar Bourbon Vanilla! Sounds fabulous. I'd gobble up some cookies n' cream or hot chocolate. I'd love to see a peppermint ice cream flavored cupcake or a Snickers cupcake. Already a BIG fan of you Jessica! Don't you just love all the beautiful photos Jessica took of my cupcakes...she is so talented. Thanks for all the awesome comments and lots for great ideas for cupcakes. I'll be trying out some very soon. Thanks Jessica for the lovely post!!!! I am a fan of Cupcake Delights on FB. I think it's amazing that Judy found her passion at thirteen and after working in a trucking bussines and pest control she finally has her dream job! I love cupcakes! Right now I would go for a red velvet one with cream cheese!!! I live in Sarasota area so I might just make a trip over to the shop one day! I love pumpkin spice flavor but I can see it is alreday on the menu. So maybe gingerbread? Sounds yummy to me! I am a fan of Pen N' Paperflowers on FB already. I became a fan of pen'n paper flowers. I'm a happy fan of Pen N' Paperflowers and love your work! 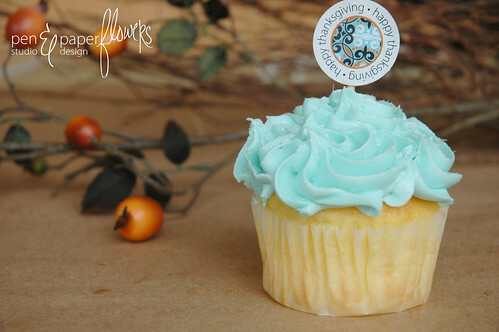 I'm a fan of Cupcake Delights, Inc. on facebook! I love that Judy was able to use her love of baking for a new career that she enjoys! 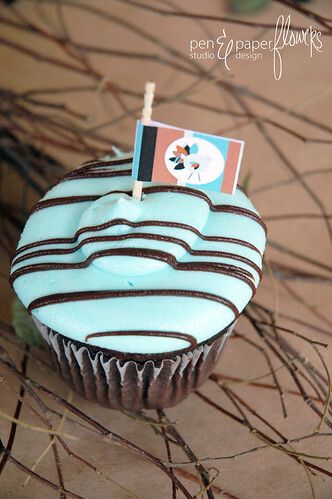 I could totally gobble up a Mount Dora Mint cupcake right now! I think Holiday Custard cupcakes would be amazingly tasty! I'm a Pen N Paperflowers fan on FB! I learned she has a daughter named Taylor. I'm a cupcake delights facebook fan! I would totally gobble up that turtle cupcake! Thanks everyone for checking us out. I hope you get a chance to come in and try out our cupcakes. I want to give a big thanks to Jessica for a wonderful post and some beautiful photos. Congrats to Vicki for winning...I hope to hear from you soon.